Yet another cinema classic from one of our favorite directors, Jim Wynorski, or as Jim likes to call himself in this film, for no apparent reason, Jay Andrews. Now that I think of it, there is a reason. In fact, what better reason could there be than to hide the fact that he's Jim Wynorski? This film is rated 3.6 at IMDb, which sounds pretty weak until you realize that such a dismal score actually places it in the top third of Wynorski's rated films. 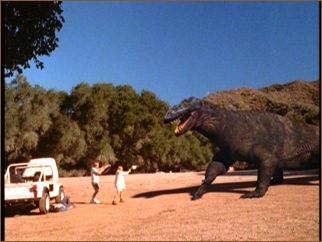 Curse of the Komodo is your basic "evil criminals land on Jurassic Park" movie, except with cheap effects. A bunch of ruthless, murderous thieves pull off a successful heist in Hawaii. As they escape, a severe thunderstorm forces their chopper to make a landing on an uncharted island. We hear the pilot tell them "brace yourself, we're gonna land hard", just as we see him hovering perfectly about two feet off the ground. Then we see him touch down perfectly, followed by a cut to the interior of the chopper, where everyone is rolling back and forth, pretending that they just crashed. I think the important thing is that when they got out of the chopper to seek out the locals, we were able to see that the female member of the gang, despite enduring a hard night of armed robbery, murder, and feigned helicopter crashes, took the time to pick up a lovely and colorful souvenir bag from the casino gift shop. 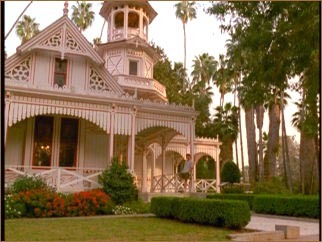 The ol' island has changed a little since Mr Roarke's days. It turns out that the only locals living there now are some scientists who have been growing a komodo dragon until it got as large as a Tyrannosaurus Rex. They needed to do this because ... um ... well, I'm not completely clear on why the U.S. Navy thought it needed giant komodos. I guess they were running low on giant iguanas, and they thought the komodos might get them through the hard times. Kind of a welch against creature inflation. That's pretty much the entire plot right there. 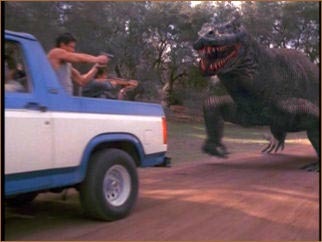 As soon as the bad guys and the scientific party got together, they spent the rest of the film pointing their guns at an imaginary creature which would be layered in later by the special effects guys, and not necessarily in a consistent size, or in the same place where the actors were pointing their guns. That's it. The first twenty minutes or so are surprisingly good by Wynorski's (admittedly low) standards, but the rest of the film basically consists of people shooting at places where special effects would be added in post-production. The film's crisis gets resolved when the Navy sends in some stock footage. Their jets blast the island with major weaponry. Every time we see the jets in action, they are different jets, and I don't mean just different serial numbers, but completely different types of aircraft! Then there are some of those ironic "the end??????" twists, and your viewing experience is complete. I think I'm getting soft in the head, because I thought this was almost watchable. I never thought I'd say it about a Wynorski movie, but this is an indifferent effort at a giant creature film. The special effects are not as bad as I expected, the plot was more or less coherent, and the acting was also better than I expected. It is not good enough to be called "good", but it is almost mediocre, which is surprising from Big Jim, because "indifferent" means "will make the career highlight reel" in his Bizarro World. I'm sure Roger Ebert must have a review on his to-do list, but he has not quite gotten to it yet. Based on this description, this is a D+. It's a grade-B movie, to be sure, but it is far better than I expected from Wynorski.